Let’s just sprint through the bad stuff: life is still stupidly stressful: even my eating and sleeping is now affected (this almost never happens!). I’m lucky that I’ve been offered counselling, but emotional support will not improve things, it’s action and solutions that I need, so I turned it down. What to do? Well when you can’t fix the big problems, you take control of the little ones. I may not be able to fix the house, but I can mop the floor. I may not be able to get all the services that my children need, but I can help them make positive progress every day. I may not be on top of the special needs and household paperwork, but I’m keeping the lights on at least. I may not be able to go to the gym right now, but I’m running to appointments if I’m the only person attending. I may have just tripped in the hall due to tiredness and stress, but my parachute training kicked in, and I fell beautifully and only have cuts and bruises to show for it! Christmas came early this week: Back in July I backed a Kickstarter project for a budget smart/fitness watch and my ‘gift’ arrived a few days ago and since I needed a boost, I opened it then and there. Of course I haven’t had time to suss out exactly how it all works, but I am enjoying some features: having the weather on my wrist, being able to turn off alarms without dashing for my phone, and most of all the revelations about the amount of activity I do: It seems I manage more than 20,000 steps every day without doing very much at all. I did wonder if the watch was counting seconds not steps, but the numbers do stop increasing if I sit down. So every time I think I’m being lazy, all I have to do is look at my watch and it gives me a little boost. Yes I know I have ‘a lot on my plate’, but when I was invited to a meeting and asked to join a Human Rights Committee that only meets 6 times a year, I couldn’t say no. I was like a puppy with a new toy at the first meeting because it will let me use my skills, do something I’m good at, and give me the chance to feel useful again. After taking part in the launch of the debut novel by writer and blogger Nicola Cassidy, it was a wonderful surprise to get a signed copy of her book December Girl in the post together with a few goodies. So far, this historical novel set in Ireland and London is a joy to read, with a feisty heroine whose story make you want to keep reading. If only I had more free time! So that’s this week’s update and reasons to be cheerful, head over to Mummy from the Heart for more. On Friday afternoon it was just another ordinary school classroom. Twenty four hours later, it had been transformed into a magical grotto full of light and colour, music and balloons, a candy cart and the sweet smell of cake. A wonderland fit for a princess. My princess. It was finally time to celebrate her 21st birthday. And celebrate we did. With plenty of music and dancing, a gorgeous cake, family and lots of lots of friends, old and new. There wasn’t even time to take many photos: we were all too busy having fun. Why a school, you might be asking? Why not a swanky hotel? Well the school is home to the Rainbow Junior Arch Club, so it is familiar to B and has everything she needs, including a Changing Places Toilet. It meant all the children from the club could easily attend, as well as many former club members who are all grown up now, just like B. And finally because the school said yes to my request and I am very grateful to them for that. As I wrote last week, with everything else going on at home, I could not have made this happen alone. Once again I asked for help, and once again my friends responded. I won’t name them on here, but they know who they are. And I hope they know how much I appreciate everything they did, from finding my daughter’s costume to making the invitations, to decorating the room and making sure everything ran like clockwork on the day, so I could spend the time with B, making sure she had the time of her life…. It’s an afternoon I will never forget and the best reason to be cheerful I’ve had in a long long time. Once again I’m seeing red at the headlines around the Carer of the Year Awards. Always putting others first is not a good long term strategy. I know women who’ve died young because they were too busy caring to get their health needs met, let alone anything else. If you’re a carer for life, as I am, you have to look after your physical, mental and emotional health in order to keep caring without burnout. But these constant media messages about selflessness put huge pressure on carers not to look for help, and relieve society of the guilt they feel about not offering it — with some exceptions, of course. As I am totally overwhelmed right now, I am going to recycle another old article, that says a bit more on the same subject, with apologies to the organisers and to those who do enjoy these awards. When you become a carer, everything changes. Not just your own life, but society’s expectations too. No matter what you were like before, you are immediately obliged to take on saintly qualities and become endlessly patient, loving, energetic, unselfish, undemanding and uncomplaining, with a beatific smile permanently plastered on your face. Don’t believe me? Look at the Carer of the Year Awards. Now obviously I have huge admiration for the winners, they manage the most challenging situations and care for the longest number of years. But what do these awards say to the rest of us? Keep your head down, keep caring and if things get really tough, you might get a day out at an awards ceremony in 30 years time. Don’t complain, don’t look for help, there’s many people who are much more deserving than you. You made it through the day? Congratulations on “surviving”. Having special children makes a family special (well actually it’s made me cross, fat, sick and tired). You think your life is difficult? Well guess what, it’s going to get harder and you will still be expected to keep going. “I’ve learned that you can keep going long after you think you can’t.” Except when you actually can’t. In the words of the song, Is That All There Is? Is getting through another day all that we have to look forward to? Well I think that carers deserve better than that. I want more, both for me and for the other carers that I know. Somewhere out there are carers whose lives do not resemble those of the award winners. I want to hear about them. Where are the stories of carers who have made a conventional success of their lives? Who have careers, who set up businesses? Who live in nice homes, enjoy hobbies and nights out, have great respite? Whose children are settled in quality residential care, and who don’t feel guilty about it and are not ashamed to say so as they know that they’ve made the best decision for their family. Who go on holidays, for goodness sake? Yep, maybe they needed a lot of help to achieve these things. So let’s celebrate the people who helped them. The services that make a difference. Let’s tell the world that many carers need that help, very very badly. They are not bad people. Everyone has a breaking point. Congratulations if you haven’t reached yours yet. But do not judge those who have. It could be you tomorrow. I was so sure I was on the right path. The future I had sketched out for myself and my disabled daughter was starting to take shape in real life. Perhaps planning and hoping too much is a bad idea? The ongoing two month crisis here and the gentle comments made to me this week mean I have to face some unpalatable truths, and reevaluate everything about this family’s future. So I’m beginning to sketch out alternative plans and reaching out for advice, but as I no longer write about all the issues affecting this family, I can’t tell you any more on here. …I got to most of my Zumba class again – the one chance I get at the moment to completely switch off for a while. …That hour between 5 and 6 pm when my eldest daughter arrives home from work, and we talk about normal stuff and laugh at the crazy bits too. …My friends who rallied round to help with a very special event happening later today. It is not an exaggeration to say I wouldn’t have managed it alone. THANK YOU SO MUCH. I know you’re shocked and stunned, I know this seems completely unreal. I know you think this is a nightmare and you’re going to wake up and find that you’re still pregnant. You need to know. This is real. That tiny scrap attached to tubes and monitors that ring and beep and flash. That’s your newborn baby. And yes she’s fighting for her life. But she’s going to make it. Your life is going to change utterly, but in many ways it will be so much better, and you will change too. You will face challenges that you never expected and find strength that you never knew you had. I won’t lie to you: there will be battles ahead. With an indifferent state and an uncaring bureaucracy. But you will find help, you will find support, and most of all you will find friends, old friends who stay in your life and new friends in the same situation. Her suffering in the hospital will end, because she will be stabilised and they will find a combination of medicines to treat her. Those bitter tears you cried with despair at not knowing how to help your daughter will be replaced with smiles of joy when she smiles at you every morning. You have the internet now, and there is lots of advice and support groups that can help. But you still might try desperate treatments. You might visit healers who live on remote mountain tops, travel abroad with a hired oxygen machine for specialist help, consult every type of therapist until you can’t take any more disappointment. You look at adults with cerebral palsy and wonder which one your daughter will resemble. Do not worry, she will look like herself. Are you even wondering what you want for her on her 21st birthday, right now when all you want is for her to live? To be kind and affectionate? To live the life of a young woman and enjoy music and dancing, shopping and friends? She is and she will. It’s going to be different, but it’s going to be okay. I’m not feeling particularly cheerful as I type this at 5am, cradling my dying phone in my palm, and listening to the latest set of worrying noises from the world’s weirdest fridge, and wondering why my disabled daughter cannot sleep. But I know I have much to be grateful for – all the usual things: I still seem to be healthy, solvent and secure. Not so much my children, but helping to make that happen for them is part of my role, isn’t it? Though it’s a lot harder than you’d think from all those photos of gooey eyed babies and happy families. But I know they exist too, in real life, and, like a drowning woman, I cling on to the raft of success stories, in my battle to escape from going under, as well as the good things in my own life. My disabled daughter B celebrated her 21st birthday – the celebrations at home were low key, but she got some gorgeous presents, including a night out at the cabaret spectacular Light It Up, which gave me the welcome opportunity to dress up for once! A shopping trip to help B spend her birthday money – mostly buying clothing and wheelchair accessories as I’m trying to wean myself off bringing her out in her (practical) buggy as she is fully grown up now. Her fabulous new waterproof GaryB wheelchair blanket should help with that transition. Another Parkrun with B and we both made more friends on the way round. 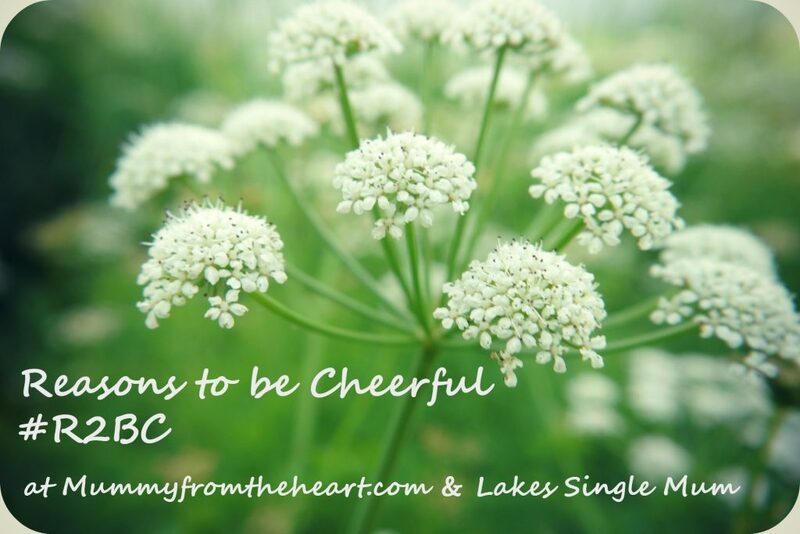 Hopefully you can find lots of reasons to be cheerful this week too.